Archives : NEAR THE TOP END OF THE TRADING RANGE - 14/10/2011. 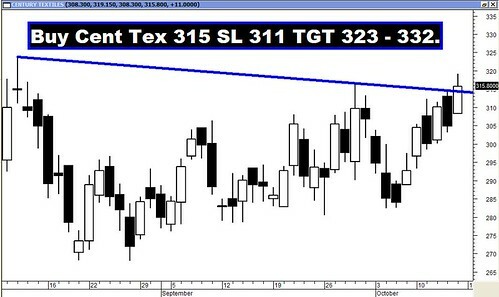 NEAR THE TOP END OF THE TRADING RANGE – 14/10/2011. Market is moving in a well defined trading range between 4720 – 5170 for more than two months now. The top and bottom end of the trading range has been tested three times without getting breached. This trading range was formed after Nifty formed a bearish breakaway gap between 5323 – 5229. The current upmove is likely to face stiff resistance around this gap. But this time the weekly candlestick pattern and oscillators are more supportive than before and hence the bulls can expect some fireworks this Deepawali. Last Deepawali market turned from up to down and the entire year was spent in correction. This Deepawali, the bulls hope the tide turns in their favour and continue throughout the year. The Sensex opened the week at 16270, made a high of 17112, a low of 16230 and closed the week at 17082. The Sensex gained 850 points on a weekly basis. Similarly Nifty opened the week at 4886, made a high of 5141, a low of 4882 and closed the week at 5132. The Nifty too closed with a weekly gain of 244 points. Both Sensex and Nifty have formed a Bullish White Body Marubuzo formation on the weekly charts and this formation has occurred after the indices took support at the lower end of the trading range for the past two weeks. The weekly charts are once again looking bullish after a gap of five weeks but the daily charts are not in sync. On the daily charts we have a Bullish Engulfing at the top which is the Last Engulfing Top. This is a bearish pattern and requires confirmation. A black body on Monday will confirm the bearish pattern i.e. Last Engulfing Top. Monday’s candlestick formation will be critical in deciding future outlook for the market. Both the indices are moving within a well defined trading range i.e. between Sensex 15745 to 17211 and Nifty 4720 to 5170. Both Sensex and Nifty have managed a close above the Bearish Falling Gap between Sensex 16833-17000 and Nifty 5059-5109 which was acting as a strong resistance area. This will further strengthen the bulls in taking on the higher end of the trading range i.e. Sensex 17211 and Nifty 5170. In case the indices take out the upper end of the trading range then it is likely to approach a strong resistance zone between Sensex 17664-17845 and Nifty 5323-5360. This resistance zone is formed by the convergence of the 61.8% of the immediate fall, 50% of the intermediate fall and 38.2% of the entire fall. This is further strengthened by the presence of falling gap. Thus we have strong Resistance Zone between Sensex 17664-17845 and Nifty 5323-5360. Both Sensex and Nifty have managed to cross and close above the short term average of 20dma (Sensex – 16529 and Nifty – 4970) and medium term average of 50dma (Sensex – 16699 and Nifty – 5018). As a result the short and medium term trends have turned up. But the market is still well below the long term average of 200dma (Sensex – 18161 and Nifty – 5450). As a result the long term trend continues to remain down. MACD has given a Buy signal but is still in negative territory. RSI has finally managed a close above the centerline and as a result it is in Buy mode. ROC is in positive territory and hence in a Buy mode. Stochastic Oscillator too is in Buy mode as %K is above %D. But %K is in Overbought Zone. ADX is quite low at 17 suggesting that the index is almost trendless. Directional Indicators have given a Buy as +DI is above -DI. OBV continues with its lower top and lower bottom formation and hence continues with its Sell signal. Money Flow has moved higher and is at 66, giving a Buy signal. Nifty OI PCR is improved and is at 1.79. 4800 Put is seeing strong buildup followed by 4700 Put. Highest Call writing is seen at 5200 strike price. Thus Nifty can be expected to find Support around 4800 and will find Resistance around 5200. Trendline Resistance for the Sensex is at 17149. Trendline Support for the Sensex is at 15739. Trendline Resistance for the Nifty is at 5149. Trendline Support for the Nifty will be at 4730. For the week ahead, Sensex will find Support at 16756-16432-16148 and will find Resistance at 17358-17664-17927. For the week ahead, Nifty will find Support at 5019-4911-4796 and will find Resistance at 5229-5323-5413. Last week the market went from strength to strength and as a result only Bharti Airtel and STFC reached their target while the other recommendations has their stop losses triggered.